Are you kidding? That’s the worst disease to go to school with. Aren’t parents genre savvy enough to see through this ploy yet? I never had the chance to skip school on a video game, mainly because there weren’t any at the time (well, Pong and Breakout maybe). I have to skip a lot of work nowadays. Gotta get my childhood back. in the days of the NES, a lot of my high-school classmates came down with this. 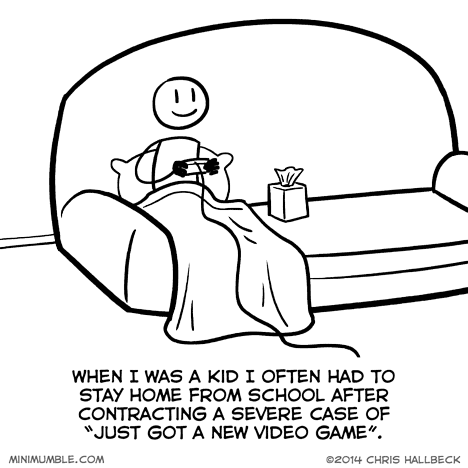 Wasn’t a case of, “you’re too sick to go to school, you’re too sick to play your new video games”? That was my mom’s rule, and I remember a couple times where I really did feel sick in the morning, and really did feel better in the afternoon, and I was so ANGRY at myself for it.